One of the most abundant natural resources in North Carolina are the trees. The majority of the trees form the 18.2 million acres of forest of North Carolina in which the majority (~ 61%) are privately owned. These trees provide an abundance of benefits ranging from clean water and air to contributing to the state economy. 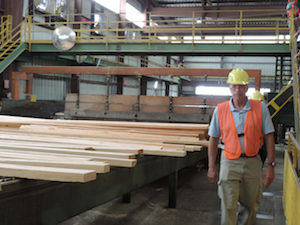 Each county in North Carolina receives economic benefit from North Carolina’s forest through the forest sector. In 2016 the forest sector contributed $12.6 billion dollars to our state gross domestic product, up from $10.9 billion dollars in 2013. The total economic contribution in industry output to the state’s economy in 2016 was $32.7 billion, supporting about 150,000 full- and part-time jobs with a payroll of $7.8 billion. For the complete view of the economic contribution of the North Carolina forest sector in 2016 read “Economic Contribution of the Forest Sector in North Carolina, 2016” To learn more about the forest sector’s economic impact for a specific county see the table “Forest Impacts by County in North Carolina” on the Economic Impact Data page.